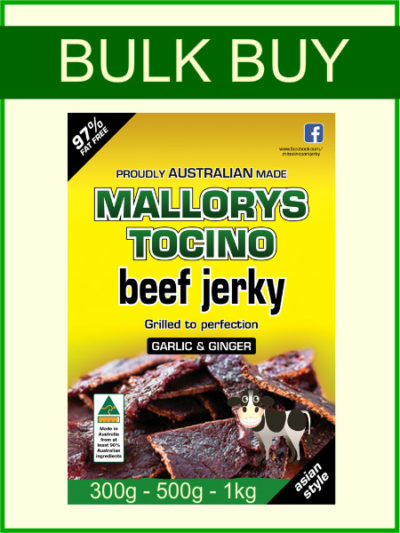 Bulk Garlic ginger beef jerky. An excellent seller! The garlic and ginger merge to give a truly unique and irresistible taste. You will certainly have problems putting the packet down. Lucky they come in 300g, 500g and 1kg packs. More to share around – or not ! Make your selection below. 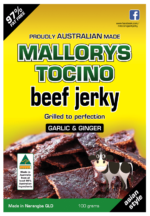 In our opinion we have the best beef jerky in Brisbane, Caboolture and the Sunshine Coast. 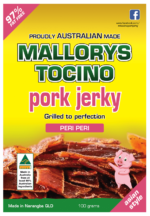 Our family jerky recipe produces healthy, flavoursome snacks. ALLERGENS – Contains Gluten & Soy.